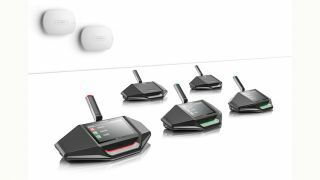 Bosch DICENTIS Wireless Conference System Bosch has released a version 1.3 of its DICENTIS Wireless Conference System. DICENTIS is based on Bosch Smart Wireless Management Software, which is designed to ensure interference-free and highly flexible wireless conferencing using standard Wi-Fi technology. This technology frees users from having to search for the best Wi-Fi channel by automatically switching to the strongest channel without interruption. The newly released software version offers rental companies or council technicians more comfort and peace of mind when configuring the DICENTIS Wireless Conference System. The system is even more stable and robust, leading to less acoustic artifacts and improved channel switching. With the updated software, it is now possible to assign and configure wireless access points (WAP) as primary or redundant, for improved meeting continuity. In case of an unforeseen infrastructural problem such as a power shortage, the redundant WAP will automatically synchronize all system settings—usually within a minute—and take over as primary WAP. The respective operation mode of each WAP is clearly indicated by LEDs on the device as well as in the browser configuration menu. Wireless WAP redundancy can be managed over the Wi-Fi network; the WAPs can be connected to each other without the need of using any cables, which comes in handy during the configuration process. The new software from Bosch also allows the exclusion of specific Wi-Fi channels during automatic channel switching. This is particularly relevant if fixed channels are exclusively reserved for other systems. These channels can be deselected in the web browser menu, thus preventing system interferences caused by channel overlapping. The graphical user interface of the web browser now features a three-bar signal strength icon, providing a quick visual reference of the signal strength of each wireless discussion device. There are also extended setup options to assign up to 25 open microphones if needed.